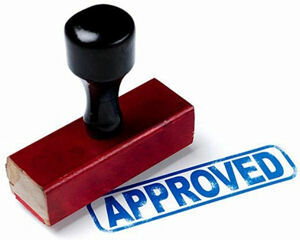 Merchant Accounts For New Businesses & Startups Still Get Approved! Just because you have a new business or startup company doesn't meant you won't be able to qualify for a merchant account! All businesses started new at some point and simply because you recently started your business is not, by itelf, any reason for declining a merchant application. However, certain things will help you qualify for a merchant account including having a long time in business, established credit card processing history, and larger balances in a bank account, all of which are, unfortunately, lacking for most new businesses. So, new businesses looking to qualify for a merchant account should be prepared to take a different approach and present documents that help them to appear as more than just a startup business. Keep in mind that most new businesses fail in their first year in business and consider how the bank would view the risk of issuing a merchant account to a new business. Visa allows a customer to issues charge back up to six months after a sale (this can be much longer with MasterCard). So, if a merchant wants to charge $20,000/month in volume, at any given time there could be as much as $120,000 in "potential" chargebacks outstanding. It's highly unlikely that all $120,000 would chargeback, unless in the case of some fraud, however, if the merchant goes out of business a year down the road, and maybe just 10% of that actually results in chargebacks because the company is no longer in business to service the last few weeks of customers, the banks would stand to lose $12,000! We all know banks hate to lose money and will do everything they can to prevent it including when scrutinizing a merchant application for possible approval. To help maximize the chance of approval for a merchant account, a new business should make themselves look like an established business by including with their merchant application things like a business plan (if one exists), copies of vendor/supplier contracts, copies of customer contracts, invoices, sales and/or quality assurance scripts and/or recorded phone calls, etc. Any documentation that will help prove that you are a real and legitimate business, you really have a business, you really know how to run a business will all help you qualify for a new merchant account. Get more tips on How To Qualify For A Merchant Account. Regardless of whether you're an established merchant looking to add a new merchant account or a new business looking for your first merchant account, you should work with an experienced merchant services provider like CyoGate that has expertise in effectively securing and handling merchant accounts.